I posted a while ago about how to pour a gaiwan, but I wanted to talk a little more about this super-useful device. What is a gaiwan? Why should you have one? Where do you get one? How do you use it? These are all good questions! Let’s break it down. It’s this ceramic thing with a lid. In fact, gaiwan literally means “lidded bowl”. Usually there’s also a base or saucer making it a three-piece brewing tool. They’re basically an ancient Chinese teapot and teacup all in one. Hundreds of years ago it was common to actually drink tea directly out of the gaiwan as it was brewing, but today we usually use them as a teapot only. Why the change? By pouring all the tea out of the gaiwan at once we have much more control over the infusion time and therefore the flavor of the tea. Leaving tea leaves in water while you drink the first cup will just continue to make the tea stronger, often masking many of the flavors and nuances available and turning the brew into a bitter broth. Of course that’s assuming the drinker is looking to find the flavors and nuances of a tea and that there are nuances to be found. Flavored and scented teas (tea containing something other than just tea leaves) are designed to provide a burst of flavor without having to look for it. 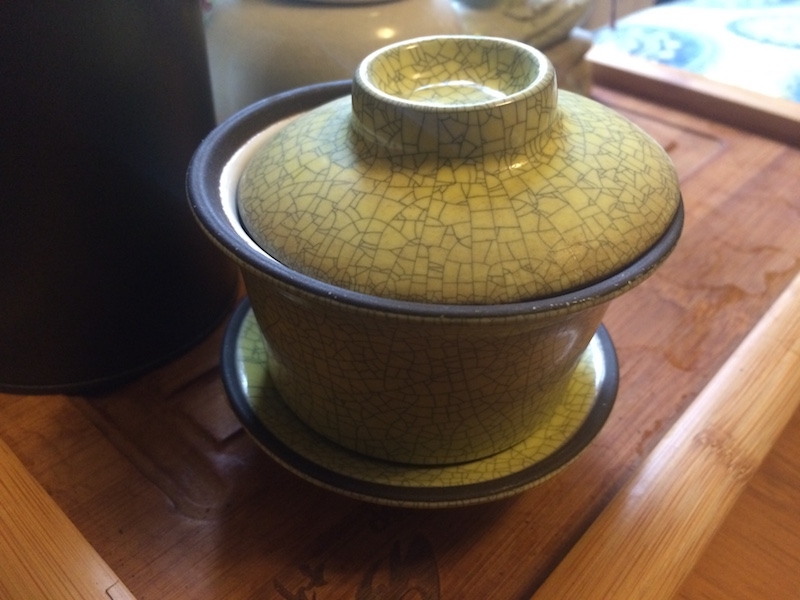 So if a gaiwan is just an unusual teapot, what’s the point of using one? Bringing out the best flavors when infusing loose full-leaf tea requires some practice and learning. There are many reasons to own a gaiwan, but in my opinion the first reason is to learn. A gaiwan is an excellent tool to learn skillful brewing techniques and also to learn about individual teas. Whenever I have a tea I’m unfamiliar with, I always try to brew it in a gaiwan first, before using a teapot. The wide opening and white-colored interior make it ideal to inspect the leaves as I begin and removing the lid makes it easy to look at the color of the liquor while I wait for the steeping to be done. Good tea infusion usually relies on timing, but I never rely on others (and certainly not packaging) to determine the proper time for my tastes. I always prefer to experiment first and learn as I go. When the color looks right, a gaiwan has the additional advantage that it pours out into a cup or pitcher almost instantly. A teapot may pour much more slowly, making determining the timing difficult indeed. Even an additional 10 seconds can significantly change the taste of some teas. When should I not use a gaiwan? Finally, it should be said that a gaiwan is not ideal for every situation. Japanese green tea, for example, is generally very finely broken and will usually not pour well from a gaiwan, since the straining mechanism only works for larger leaves. A Kyushu or shiboridashi is a much better idea there. There are other teas with tiny leaves that may also cause a problem, but for any rolled oolong, Puer, and most green and red tea you’re going to be fine. Where do I get a gaiwan? If you have a local tea shop, you’re may already be in luck. On the other hand, not everywhere that sells tea also carries traditional teaware. 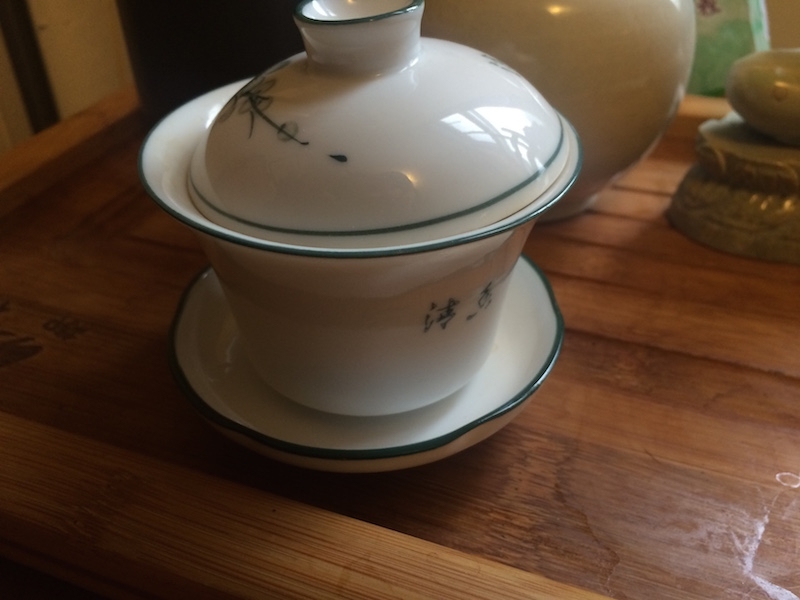 The web makes buying teaware like a gaiwan much easier than it once was. That said, there are a few things to look for when selecting one. First, consider the material and color. I would suggest only purchasing gaiwans that have a white glazed interior. The white color makes it easier to see your leaves and tea color and a glaze protects the cup from absorbing any flavors from one leaf that might influence other types of tea. Porcelain is a pretty good bet, but clay gaiwans also work. The color on the outside of the gaiwan is less important so feel free to look for something pleasant to your eye. Also you might want to think about size. Any size will probably be fine, but many traditional gaiwans are appropriate for only a small cup of tea per infusion, whereas others are quite sufficient for sharing between a few people (or filling a mug). Small ones are easier to handle and pour while larger ones are often harder to grasp with one hand (although as you’ll see that’s not necessarily a bad thing). This is very much up to personal preference, but I would err on the side of smaller if you’re unsure. I’m going to include a short video here showing the common ways I use a gaiwan. This, perhaps more than anything, seems to be what prevents people from using one. Below the video you’ll see a few tips that may help. Use fewer leaves than you think if you’re filling by eye. Leave about 1.5cm above the level of the water when pouring to avoid superheating the rim. Grasp only by the rim edge and the lid knob to avoid burning. Make sure the lid is tipped just a bit to avoid dumping leaves or blocking the flow. Pour quickly and decisively by tipping the gaiwan more than 90 degrees. Slow pouring or a gentle angle will cause the boiling water to run down the outside of the gaiwan. Make sure all the water is out of the gaiwan when you are done pouring or the leaves will continue to steep. I hope everyone has a chance to try using a gaiwan someday! If I were to recommend just one piece of teaware for a tea lover, a gaiwan would definitely be my pick. Happy sipping! 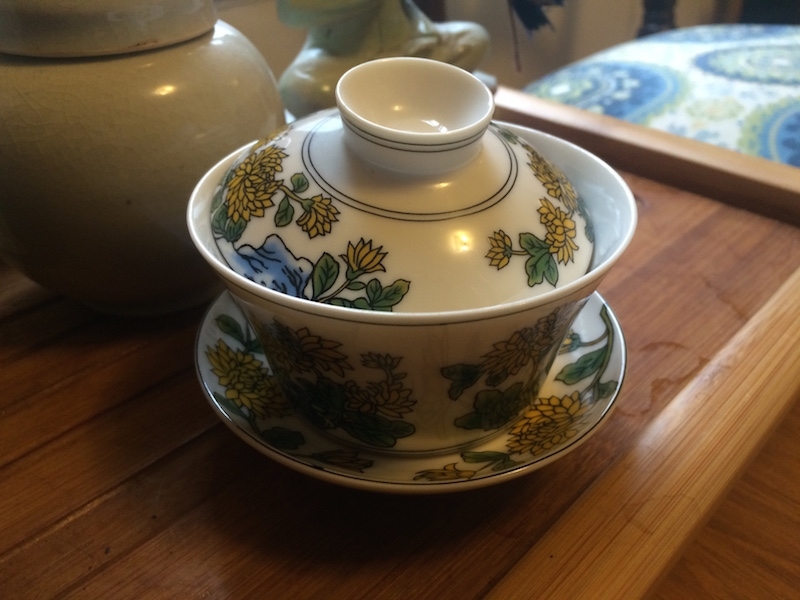 This entry was posted in Method and tagged gaiwan, teapots on November 13, 2014 by payton.